I’m pretty excited. I found this look for you in regular and plus size! 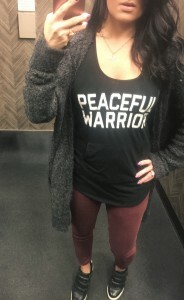 The jeans are VERY inexpensive for both, and the Peaceful Warrior tee I’m wearing in the picture is linked HERE and on sale for ten bucks! It even has a pocket (everything is better with a pocket). As for the cardigan it’s oversized and baggy (perfectly so) and soft. I am wearing a small in the picture. If you get a large it will certainly fit plus size. I’ve linked you below. Hey, have I told you lately that love kills? Not in a knife to the heart way (though it does that too). I mean in a dousing out all the evil things-way. Peaceful warrior means you go to war against evil using love and kindness as your weapons. I’ve never seen love fail. Not ever. Wear it as your armor instead of defensiveness, and instead of retaliation. It will keep your heart kind and soft even when someone is throwing hate and shade. And given time love always turns the hardest hearts. Be consistently kind to your enemies. Not for them, for you.